Imagine for a moment that you've been asked to pinpoint, to the day, the absolute creative zenith of the Grateful Dead's career. Could there be a more maddening challenge? There could never be anything approaching consensus on such a question, especially among an audience as large, diverse and opinionated as the Dead Heads. No two people have the same criteria. Everyone's got a favorite era, keyboard player, favorite Garcia guitar, favorite you-name-it. The band had many career peaks and valleys over the years--how could anyone choose? Well, just for the hell of it, let's say that your life depended on it… that you absolutely had to name the peak moment in Grateful Dead history. One could do a lot worse than to impulsively blurt out: "May 28th, 1977!" Why May 28th? That was the date that the Grateful Dead came to Hartford, Connecticut to play the final show--the very performance, fortuitously enough, preserved for the ages on this recording--of a marathon Spring Tour that many informed observers consider the single greatest sustained burst of creativity in the band's long performing career. One thing that makes this particular show all the more extraordinary is that it came at the end of such an exhausting and wide-ranging trek--26 shows in 37 days--yet it betrays not a trace of physical or artistic fatigue. This recording reveals the Dead playing with unparalleled energy, wit, passion and power--a band at the very top of its game, even by the high standard of a tour that was characterized by a thrilling consistency of excellence. The beginning of 1977 found the Grateful Dead at a major career crossroads. The band's ambitious attempt at total autonomy earlier in the decade had taken a toll, both psychically and fiscally. Efforts were being made to pare back to the bare essentials, and to get back in earnest to the primary mission of making music. To that end, the Dead had taken a nearly two-year vacation from touring, mothballed the magnificent but insanely expensive "Wall of Sound" P.A. system and folded their Grateful Dead/Round Records company, an inspirational template for many artist-owned indie labels (though it would eventually relaunch and flourish as the source of the Dead's archival releases). They found a home for their recorded work at Arista, a new label started by former Columbia Records head Clive Davis, and began developing material for a studio album, which they would record in the early months of the year before heading out on Spring Tour. Jerry Garcia would do some additional multitasking during this period, racing to complete the concert documentary The Grateful Dead Movie, which he co-directed and which would have its premiere in New York City just four days after the tour ended. During breaks in the film editing sessions, Garcia would grab his guitar and labor over a major composition he and Robert Hunter were developing for the new record, which would eventually supply the album's title: Terrapin Station. The Dead, at Davis' urging, had agreed to put their Arista debut in the hands of a producer from outside the band's tight circle of creative and technical allies--the first time they had done so since an exasperated Dave Hassinger fled the studio in the early stages of the Anthem of the Sun sessions in 1967, driven away by the Dead's anarchic, wildly experimental indulgences. Chosen to helm the project was Keith Olsen, a newly hot commodity by virtue of his role as co-producer of Fleetwood Mac's eponymous, career-redefining 1975 album. Olsen's creative choices for the Dead--which included lounge-jazzish saxophones, a full choir and ornate orchestral arrangement by longtime Elton John associate Paul Buckmaster--would become the subject of more than a little controversy, not just among fans and critics but within the band itself. However, once the Dead took the songs written for Terrapin Station out on the road there was no denying their power as live performance pieces. This was especially true of the album's two most musically ambitious works, which would instantly become beloved staples of the Grateful Dead repertoire and remain so for the rest of the band's touring life. The first of these was "Estimated Prophet," Bob Weir and John Barlow's portrait of a particularly California breed of delusional would-be visionary, which managed to be at once uplifting and disturbing thanks to the incantatory lyric and to Weir's ingenious musical setting, a sinuous Reggae-flavored groove knocked beautifully off-kilter by a 7/4 time signature. The second major new piece, which took up the entire second side of the LP, was utterly unlike anything the Dead had attempted before: the epic, allegorical "Terrapin Station" suite--as felicitous a marriage of music and storytelling as was ever accomplished by Jerry Garcia and Robert Hunter in a the course of their long and fruitful collaboration. While "Terrapin," in its studio incarnation, struck many listeners as a little too… well… tasteful, it became a whole other kind of beast when let loose in front of a live audience, driven by power guitar hooks, thunderous percussion and bone-rattling bass licks. As the new album would not be released for another couple of months (and since live show recordings didn't get circulated with anywhere near the speed that they do today, in this age of MP3 files delivered to your desktop before the band gets back to the hotel), these new pieces were still unknown to most of the Dead Heads attending shows on this Spring Tour, and their impact upon those unsuspecting ears was immediate and profound. 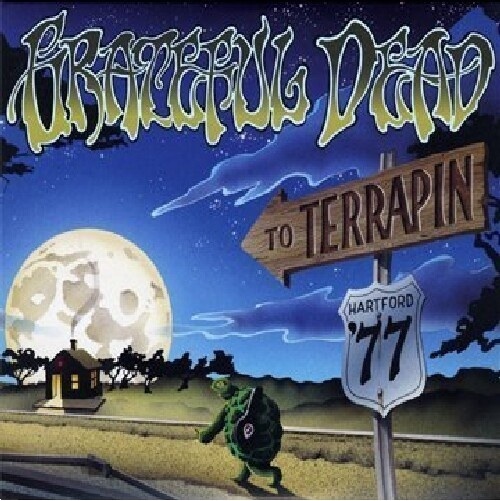 Unlike many of the Dead's earlier works, which started their performance histories as bare sketches and were developed by trial and error into full-bodied songs on the road, the Terrapin material had been nurtured in private, during an intensive rehearsal process as the band prepared to make the album. As a result, the new tunes were first apprehended by live audiences as surprisingly mature works, and they would get even better with time. As compositionally intricate as anything in the Dead's book, these songs would also quickly take their place among the band's most satisfying points of departure for collective improvisation. By the time the tour reached its triumphant finale in Hartford on May 28th, it was readily apparent that the new songs--including, in addition to "Terrapin" and "Estimated Prophet," the Phil Lesh/Peter Monk rocker "Passenger" and Bob Weir's red-hot reinvention of the Rev. Gary Davis gospel-blues classic "Samson and Delilah"--could proudly take their places with such longstanding pillars of the Dead cannon as "Bertha," "Sugaree," "Jack Straw," "Candyman," "Playing in the Band," "One More Saturday Night" and other standbys heard on this recording. This album was released in April 2009.